Embedded in the Tyrrenian Sea, the Aeolian Islands are the pride of Sicily, few miles away from the north-western coast. Arch shaped, Alicudi, Filicudi, Salina, Lipari, Vulcano, Panarea and Stromboli are also known as ‘seven sisters’, because they are ‘facing’ each other: from each one of them, in the deep blue of the sea fazing in the sky, the profile of at least one of the other islands will be visible, especially if admired from the top of one of them in a slightly windy day, which isn’t uncommon here. The very existence of the these winds, stronger or lighter, gives name to the islands, heritage of the Greek mythology. Aeolian Islands aren’t only Eolo’s realm, Sneezy, the God of winds, here the four elements are condensed in their maximum strength: fire, constantly bursting from Stromboli’s mouth, it merges with the blue sea, a sea full of treasures (a multi-shaped coral deposit was recently discovered) along its path goes trough the black ‘sciara’, ‘the road’, the lava bed made of volcanic dust and rocks. Stromboli unveils the archipelago’s nature: even if they are estimated to form in different ages, the seven sisters have in common their volcanic origin dated in the Quaternary. Signs of the volcanic activity are easily visible nowadays, not only on Stromboli, but also on Vulcano where the geological activity is in constant process by the edge of the main crater since the 1890 in the spectacular eruption, and at Panarea, where gases sprout out in the deep along the Basiluzzo’s rock. Therefore the archipelago offers a natural environment to enjoy, experience to do but at the same points of reflection: what pushes Stromboli’s inhabitants to live on the island, knowing the high possibility of an eruption? A little, distant world where is the nature rhythms who still shapes people’s lifestyles and philosophy. Because of this intense mood writers and film directors have inspired themselves with the Aeolian archipelago for their famous operas: Jules Vernes chose Stromboli for the end of ‘Journey to the center of the earth’; Rossellini with his ‘Stromboli God’s land’ showed to the world, back in the 1948, the reality of these islands, remote and unknown until that moment; in 1961 Antonioni wanted them for ‘The Adventure’ and in the 1994 Nanni Motetti with ‘Dear diary’. ‘The Postman’, set in Salina, will be forever bound to the image of this island not only with the unforgettable Massimo Troisi, but also with the poetry. Even though today the archipelago is a desired tourist destiny, the most suggestive and beautiful places remain privilege of those outdoor lovers which are keen to discover the most beautiful landscapes and characteristic corner. There are many sports you can practice here in addition to trekking: mountain bike, snorkelling, kayak, sailing, paragliding and even skying on volcanic sand! On every island there are trekking tracks, explained as it follows in our recommended selection. The crater is well visible from the very arrival on the island and its peak is easily reachable trough the road that runs along the little town. At the port, off the hydrofoil, go on your left until you reach the path properly indicated on the left which takes at the start of the mountain track. Once you make it to the edge of the crater you will observe the spectacle of the permanent fumarolic activity which proves the volcano is alive and only appears to be dormant. The best way to enjoy it is spend it together with a local guide which will be able to tell you the story of the last eruption, back in the 1888, admiring the sunset and the wonderful view on the other islands. Recommended the use of gaiters; headlamp compulsory to come back after sunset. Lipari - Kaolin Caves and Saint Calogero’s thermal baths. The complex geology of this island allows formation of kaolin, obsidian and pumice to be admired. A breath-taking walk gets across the island which allows to discover together with the geological, those historical and panoramic aspects. Starting from Quattropani (reachable in taxi) follow the path that takes you to the kaolin’s caves, a little canyon with colour changing walls with with Connor changing walls. Sticking to this path you will get across with the Saint Calogero thermal baths, antique Roman site, where hot water still flows out today. A magnificent view on Salina keeps you company along the entire walk. Since the path is not well indicated, if you don’t have a guide, it is recommended to do the track to the geophysical observatory, which is more accessible. Salina - Mountain Trench of Ferns. Salina which from far away seems to be made by two different islands due to the shape of the two volcanic cones which it is compose by, it’s the ‘green’ island the richest in vegetation and the highest in quote (962m). From the sanctuary of Val di Chiesa (340 m) it is possible to reach the peak of the Mountain Trench of Ferns, entering the natural reserve which surprises you for its wooded environment. In addition to the characteristically Mediterranean maquis, very dense here, the peak is typical for its elms, oaks and chestnuts trees. From Santa Marina Salina’s port the sanctuary is reachable with public transport or by taxi. A tour around the island is recommended and a stop at Pollara, beautiful bay which gifts you a breathtaking sunset. Panarea is the oldest, the ‘chic’ one of the Aeolian Islands. The path which takes you to the peak begins in the labyrinth of narrow streets unraveling between the typical white little houses decorated with sparkling colourful bouganville. 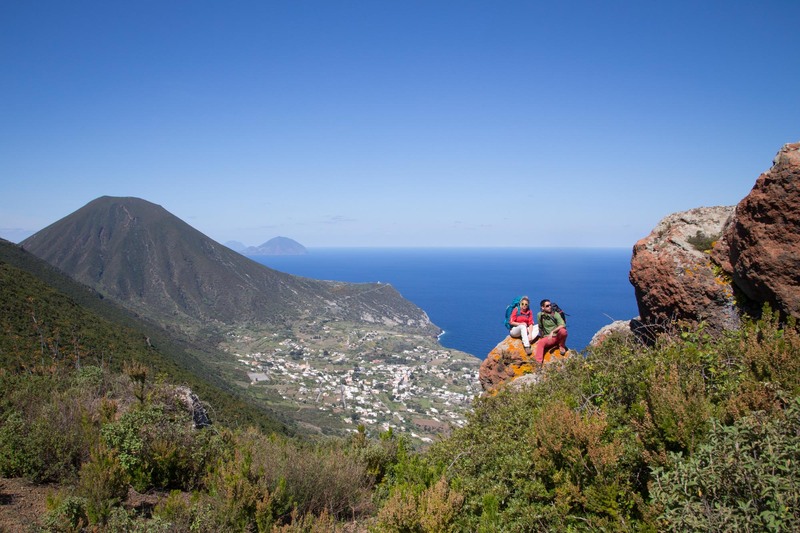 From the top of Pizzo Corvo you can admire a magnificent view of the rest of Aeolian archipelago. On the way back you will have the possibility of visiting a prehistorical village on the cape of Cala Junco, the most beautiful and famous beach of Aeolian Islands. Stromboli - The way up to the crater. The ‘Queen of the islands’, the most surprising one, no doubt. The ideal way is dedicating the morning to a tour around discovering Ginostra e Strombolicchio on the boat, and in the afternoon climbing up the volcano at 950 m heigh. The company of a volcanic guide offers you the possibility of deeply learning about one of the most famous volcanoes in the world which surprises you for the frequency of its explosions and it has been active for the last two millenniums. The late afternoon walk back along the long channels of sand adds an extra fancy reason to do the exploration. The access to the trails is regulated by the Civil Protection and it can varies in accordance with the volcanic activity. For safety reasons the access to the top peaks is bound to the presence of an authorised guide. It’s helpful to carry clothes for half-mountain environment. One of the most remote and less polluted island. The way up to the top of the Mountain Trench of the Ferns, which takes its name from the plants which it was covered by in the past, can be made going through heather fields and other Mediterranean species such as mastic, arbutus and broom. From the top the sight moves on Alicudi on the rock of the La Canna. This island, almost perfectly round shaped, it’s one of the smallest and wildest of the archipelago, A little glimpse of paradise forgotten by the world where the only way to commute is by donkey. A beautiful hike is the one it takes to the Saint Bartolo’s Church (403m), unique historical monument dated 1821. From here a wonderful view of the sea and the other islands is admirable. The best season to actively enjoy the Aeolian Islands, not excluding winter, it’s between the end of March and the end of October. However, considering August temperature can go up to 30-35 °C, and in this month they are very busy destination, it’s recommended for those in search of tranquillity and nature to come to the archipelago in the other periods of the year. For hiking the best period is between March and July between September and October. 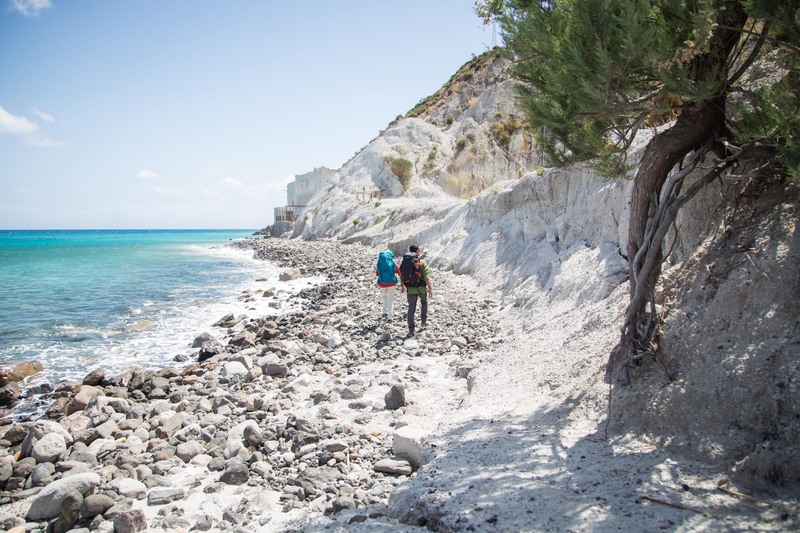 Despite the island destination are considered by many as ‘marine ones’, it’s convenient get prepared with backpack, trekking shoes, sticks and light clothes equipment, with an extra windproof jacket for the hike on the Stomboli. Also pack a front headlamp in your backpack because some of the islands aren’t properly illuminated. Absolutely carry sun protection, a hat and water flasks to keep hydrated and some reserve. The eventual risks due to volcanic activity will be communicated at the arrival on the island and the hike on the peak would be eventually cancelled by the volcanic guides companies. Mediterranea Trekking it’s a tour operator since 2005 specialised in organising sportive and naturalistic tourism. 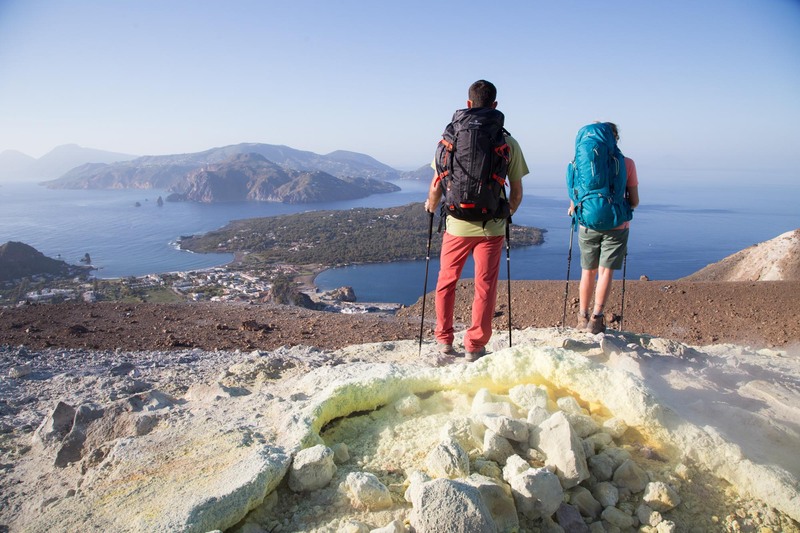 Reference for twelve years of Terres d’Aventure, the French tour operator leader in the ‘adventure trip’ sector, offers packs trekking dedicated covering the entire Sicily island and Calabria, Puglia, Basilicata and Campania areas. The trips available are usually taken by small groups and always focused by a local guide which will keep you company trough the whole journey, but also offers packs for individual customer (free tour) supported by a fully detailed technical file, gps tracking and related cartography and 24h staff assistance, for whatsoever problem. The top-sell product it’s an eight days tour that unravels between Etna and the Aeolian Islands, allowing a full immersion in the Italian volcanoes world. Between a variety of offers also cruising in Kayak in the Aeolian Islands, a tour trekking in western Sicily (Egadi), and a tour trekking in the Baroque Sicily (Siracusa, Pantalica). The staff will be at your disposal to plan and organise personalised tours for groups or individuals including sport and nature and also daily hikes.